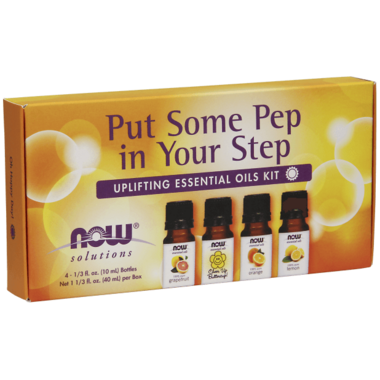 Now Essential Oils Put Some Pep in Your Step Uplifting Essential Oils Kit gives the gift of cheer, and put some pep in someone's step with this Now Uplifting Essential Oils Kit. ​Life is an endless to-do list, so staying energized throughout your day is a must. But you don’t need to guzzle unhealthy caffeinated energy drinks or use other questionable methods to boost your energy. Make sure to get plenty of rest, eat healthy, exercise regularly, and put a little extra pep in your step with the invigorating aroma of essential oils from NOW Foods. Caution: Keep out of reach of children. Avoid contact with eyes. If pregnant or lactating, consult your healthcare practitioner before using. Do not use on skin. Reacts strongly to sunlight and other sources of ultraviolet light. Natural essential oils are highly concentrated and should be used with care. I love citrus based scents and this product has all of that! Love the grapefruit oil! Great addition to my own collection of oils! Very fresh and truly uplifting! 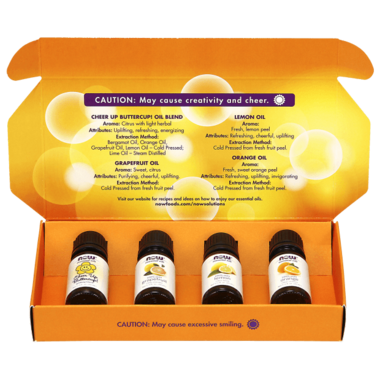 great citrus line up - and cheer up buttercup is a great blend - the bergamot oil in the blend is a nice treat, it's like Earl Grey meets citrus. Great scents! I love them all. Refreshing and comforting. Lovely introductory set. I keep the 'cheer up buttercup' on my desk at work! I love these oils. I use them in a diffuser in my office. They all smell so great, but my favourite is Cheer Up Buttercup, a blend of bergamot, orange, lime, grapefruit and lemon oils. The packaging is very nice and would make a great gift for someone as well. I am loving this amazing blend of peppy essential oils and may soon need to buy another. I recently purchased it out of wim after purchasing the peace and quiet set by NOW Foods. The grapefruit blend is perfect for blending with peppermint as an energizing, and focusing mix for car aromatherapy diffusers. I have been using essential oils for a long time and got a few of these for my friends for Christmas to introduce them to essential oils. These are some great oils to start with.